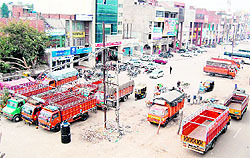 Owners of commercial establishments and traders at City Centre, near bus stand, are up in arms against the Amritsar Improvement Trust (AIT) and Municipal Corporation (MC) for their failure to remove illegal parking of heavy vehicles in front of the centre and to re-lay the footpath. The incidents of six undertrials escaping from the Bakshikhana and two groups of undertrial prisoners clashing with each other during the week has once again brought to fore the lack of security arrangements at the district courts complex. 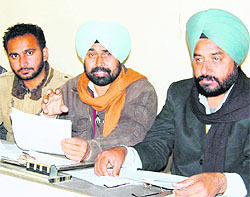 Following a tip-off, the D-Division police has booked six bookies, allegedly involved in match fixing and betting on the winning prospects of candidates of various Assembly constituencies in the recently concluded Punjab Vidhan Sabha elections. Three snatching cases have been reported in the city in the past 24 hours. Among the three victims, two were tourists - one from the UK and other from Jammu. Deputy Commissioner (DC) Rajat Aggarwal has forwarded the request of various youth organisations demanding granting of national memorial status to the ancestral house of martyr Madan Lal Dhingra, located in Katra Sher Singh locality of the walled city, to the Chief Secretary, Punjab, today. The chairman of the Zila Parishad has asked Rural Medical Officers (RMOs) in the district to work along with the District Health Department so as to provide better medical services to the district. Need for research in bio-technology field to meet the growing demand of food was stressed during the “18th Popular Bio-Technology Lecture Series” held at Khalsa College here today. The Sultanwind police has nabbed Shamsher Singh, alias Shera, resident of Bagichi Lakha Singh, and seized a stolen motorcycle (PB-02-AM-8123) and a welding gas cylinder from him at a naka on Bhai Manjh Road. However, his accomplice Laddu, resident of Gurwali village managed to escape. Winner of the prestigious Maulana Abul Kalam Azad (MAKA) Trophy 20 times, Guru Nanak Dev University has lagged behind this time too. The trophy was won by Punjabi University, Patiala. 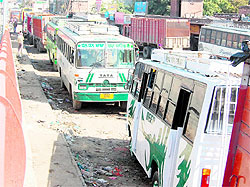 Owners of commercial establishments and traders at City Centre, near bus stand, are up in arms against the Amritsar Improvement Trust (AIT) and Municipal Corporation (MC) for their failure to remove illegal parking of heavy vehicles in front of the centre and to re-lay the footpath. They rued that as a result their business was hit and they were suffering losses. Gurjinder Singh, owner of a commercial establishment in the centre and also patron of the City Centre Traders Association, said private buses, trucks, tempos and auto-rickshaws remained illegally parked on about 100 sq feet forecourt of the market. He said the spacious place was meant for parking of vehicles for shopkeepers, their employees, persons working in offices and visitors to the market. Contrarily, he said, the area had been encroached upon by heavy vehicles being operated by private commercial transporters. He stressed that the Amritsar Improvement Trust (AIT), which established the City Centre, duly mentioned in the documents that the open space in the forecourt would serve the purpose of parking of vehicles by the shopkeepers and visitors. He informed that 40 SCOs, operational in the City Centre, were dealing in various trades and services, including banking, hospital, hospitality, retail and wholesale offices, finance and education. He added that the City Centre, considered to be the first organised commercial market at the holy city’s entrance on the Amritsar-Jalandhar Road, ideally should have been a beautiful place to greet pilgrims arriving from various parts of the country from this road. City Centre Traders Association vice-chairman Sarabjot Singh said despite numerous representations and reminders to the authorities concerned in this regard, there was yet no positive response. “The indifferent attitude of the authorities towards their plight forced many shopkeepers, especially running business on rent, to wind up their operations and shift to other locations in the city, he rued. President of the association Shashi Pal said the demolition of footpath was another big jolt to the market. He recalled that the footpath was demolished for the construction of the elevated road. He said their communiques to the AIT and the MC had little impact as both organisations were avoiding owning the responsibility. The absence of security can be seen at most of the entry points (about half a dozen) to the district courts complex. 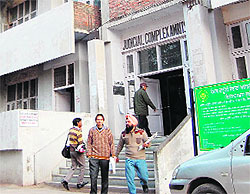 Even as policemen are present at the entry points to the judicial complex building, lawyers say there number is not enough to keep an eye on the large rush of visitors. The large number of entry points to the courts complex, which houses many other offices besides the judicial offices, is not good from the security angle. Further, the unmanned parking areas inside and outside the complex, too, are unsafe from the security point of view. Advocates expressed that in the absence of proper vigil the courts complex could become a soft target for the anti-social elements. He added that a sense of security was missing among the advocates and other staff of the courts complex. He said vehicles bearing the insignia of the Bar should only be allowed inside the courts complex. He added that entry of private vehicles should be strictly checked and allowed only after proper verification. Saini said the courts were visited by hundreds of people everyday and the complex was required to be converted into a high-security area. The booked bookies have been identified as Rakesh Kumar, Dara, Vicky, Tony Lamba, Deepu Mota and Tidi, all resident of Shakti Nagar Chowk in the walled city. The police has registered a case under Sections 13-A, 3 and 67 of the Gambling Act, besides Sections 420 and 120-B of the IPC against them. The Jandiala police has arrested Maninderjit Singh of Taragarh for possessing 350 gm of opium. His accomplice, Gurjit Singh of Dharah village, however, managed to escape. A case under Sections 18, 61 and 85 of the NDPS Act has been registered against them. The accused were coming on a motorcycle (PB-02-AX-1776) near Gunowal village when they were caught. During search the police recovered the contraband from their possession. As per information, Ranjit Kaur, alias Kiran, resident of the UK, was going in a rickshaw along with her aunt Manwinder Kaur of Medical Enclave on the Race-Course road when two snatchers strike. In her complaint, Manwinder alleged that the two motorcycle-borne unidentified youths came from behind and snatched the purse of her niece and fled away within no time. She said her purse contained 300 pounds, Apple-4 mobile phone, camera and debit card of Lovind Bank. The Civil Lines police has registered a case under Sections 379-B and 34 of the IPC. In another incident, Tirath Kaur, resident of Poonch district in Jammu, was robbed by two unidentified motorcycle-borne youths when she was going to pay obeisance at the Golden Temple with her son Paramvir Singh in a rickshaw. The incident took place near Suraj Chanda Tara Theatre. She stated to the Ram Bagh police that the miscreants came on a motorcycle from the Suraj Chanda Tara theatre side and ran away after snatching her purse having Rs 24,000, two mobile phones and gold jewellery worth Rs 60,000. In the third incident, Ishwar Singh, resident of Krishna Square, complained to the Ram Bagh police that two unidentified persons snatched his Blackberry mobile phone, while he was standing outside his house. He requested immediate decision on the matter to stop further demolition and construction work at the place. He said subsequently the drawing of the blue print for raising a memorial could be initiated. The youth organisations, namely the Sarb Bharat Naujwan Sabha, Shahid Bhagat Singh Naujawan Sabha, Naujawan Bharat Sabha and Janwadi Naujawan Sabha, came together demanding the announcement of the national memorial status and immediate halt of construction activity at the recently demolished ancestral house of the martyr. Prithipal Singh Mari Megha of the Sarb Bharat Naujwan Sabha said they had been demanding for a long to convert the martyr’s house into a museum so that coming generations must be acquainted with his sacrifice. He rued that delay in action on the part of the government led to the demolition of the house. Leaders of these youth organisations said the government must procure the martyr’s house, turn it into a national memorial, get any further construction on the site stopped and set up a library in which literature, books and other material related to Dhingra be kept. General Secretary of the Shahid Bhaghat Singh Naujawan Sabha Pargat Singh Jamarai said the memorial would be a guiding force to the present generation. He felt that the memorial would wean away the youth from the drugs and instead, instill in them a feeling of patriotism. General secretary of the Naujawan Bharat Sabha Bhupinder Longowal opined that thousands of people from various parts of the country were daily visiting the holy city to pay obeisance at the Golden Temple and visit the Jallianwala Bagh. He said the house of Dhingra, the first Indian freedom fighter who was executed in London in 1909, would be another stopover in their itinerary. Almost a year back, the government had made an announcement that the house would be procured to be converted into a museum, but in vain. Hailing from an affluent family of the holy city, Dhingra had gone to attain higher education in London, where he gunned down Sir William Curzon Wyle on July 1, 1909. At the age of 26 years, he was executed the same year. However, his father, close to the British government, had refused to accept his body. Earlier, the RMOs were working under the Rural Development Department and not under the health department. This had created an ambiguity and lack of coordination among the health staff, said an insider. Dr Randhawa said now the SMOs at block levels would be able to monitor the works of the RMOs. He added that even the department would bypass their recommendations and suggestions as far as the subordinate staff working under them is concerned. Kumar also made an appeal to the Zila Parishad, block samiti and panchayat representatives to support the health department in wiping out polio from the district. The lecture series, sponsored by the union government, was organised by Department of Bio-Technology in collaboration with the Punjab State Council for Science and Technology (PSCST). Micro-biologist from Punjab Agricultural University (PAU), Ludhiana, Dr GS Kochar, said environment friendly approach must be evolved to improve shelf life of food. Another senior scientist of the PAU, Dr SK Sharma, said technology to preserve food and nutraceuticals (another name of functional food) is important. In the third and final lecture, Dr Alkesh, a senior scientist from PSCST, talked about the research on engines in food industry. Khalsa College Governing Council Honorary Secretary, Rajinder Mohan Singh Chhina, was the chief guest. Since 1969, when Guru Nanak Dev University came into existence, it won the MAKA Trophy 20 times. Surprisingly, the performance of the GND University is contrary to the status it is enjoying, that of the 'centre of excellence in sports' awarded by the University Grants Commission (UGC). Jalandhar Tribune takes a look at what were the factors behind the GND University lagging behind in bagging this prestigious trophy. Sources revealed it was Punjabi University's well-planned sports promotion strategy which was working wonders. "In the past five to six years, Punjabi University introduced dedicated sports wings apart from those in the colleges. It has been instrumental in holding long-term sports camps in different disciplines and giving handsome cash prizes to budding sportspersons," said a professor from the sports department of Lyallpur Khalsa College. He said it is not that the GND University did not fare well, Punjabi University has improved its record in the past some years.